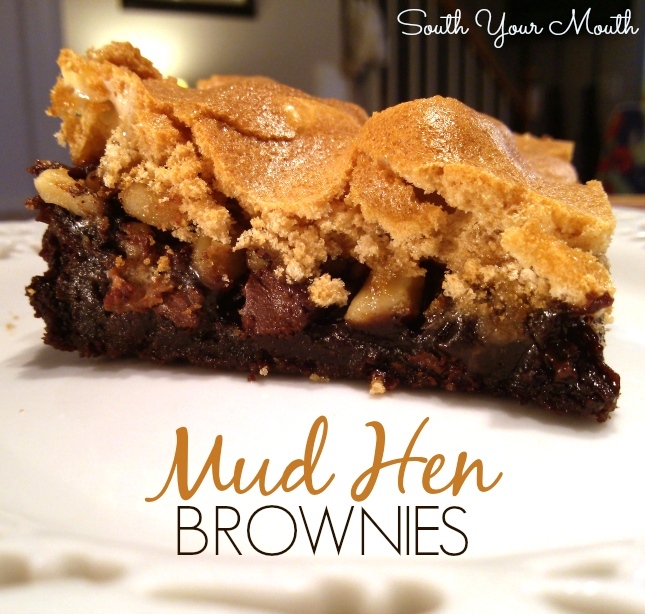 Ever since I first made the Mud Hen Bars I've been thinking about making them into brownies. Just switch out the bottom layer with brownie batter and BOOM! oh, hello wicked cool new brownie recipe! I swear Mud Hens have got to be one of the neatest recipes I've ever made. Everybody’s always like what in the world is that?! That meringue topping is just too cool and really makes for a unique experience. It’s crispy and chewy at the same time. It’s like an epicurean oxymoron. Ha! See there Mrs. Jowers, I was paying attention in English. You really didn't need to make me sit in the hall. All the time. Because I was talking constantly. Even when you moved my desk. Three times. Prepare brownie batter per manufacturer’s instructions*, using two egg yolks ONLY (separate eggs and set whites aside for later). Spread brownie batter into prepared pan. Top brownie batter evenly with chocolate chips, marshmallows and nuts. In a cold, clean mixing bowl beat egg whites on high speed until stiff peaks form. Fold in brown sugar and stir until smooth and there are no lumps. Spread egg white mixture evenly over chocolate chips, marshmallows and nuts. Bake at 350 degrees for 20 minutes then cover pan loosely with aluminum foil (just lay a sheet over the pan – don’t seal it) then continue baking for 20 more minutes or until brownies are cooked through. Remove from oven, uncover and cool for one hour before serving. Store in an airtight container. *If your brownie mix calls for three eggs, only use two and add 1 tablespoon water. Can't wait to try these. Bob's Red Mill makes the best gluten free brownie mix. Just use dairy free butter and we've got a gluten/dairy free version of your Brownie Mud Hen Bars. Can't wait! My kitchen is ripped out for remodel. Should this be the first thing I make in my new kitchen? Nicely done, Mandy! I haven't made Mud Hens in years. Your brownies are a great play on the original recipe. Looks delicious, but you left out part of the ingredients - the part about the egg white mixture. What kind of nuts should be used? I use walnuts or pecans. 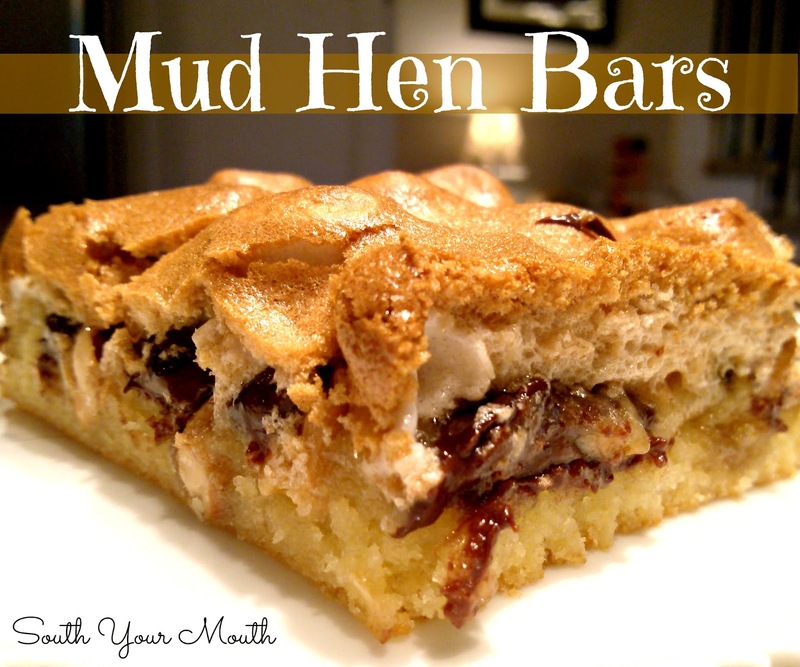 Ohhhhhhh... I’ve made regular mud hen bars before... they were delish! But these? These look A-MA-ZING! I must make these! Does this recipe also work with a scratch brownie recipe instead of a brownie mix?